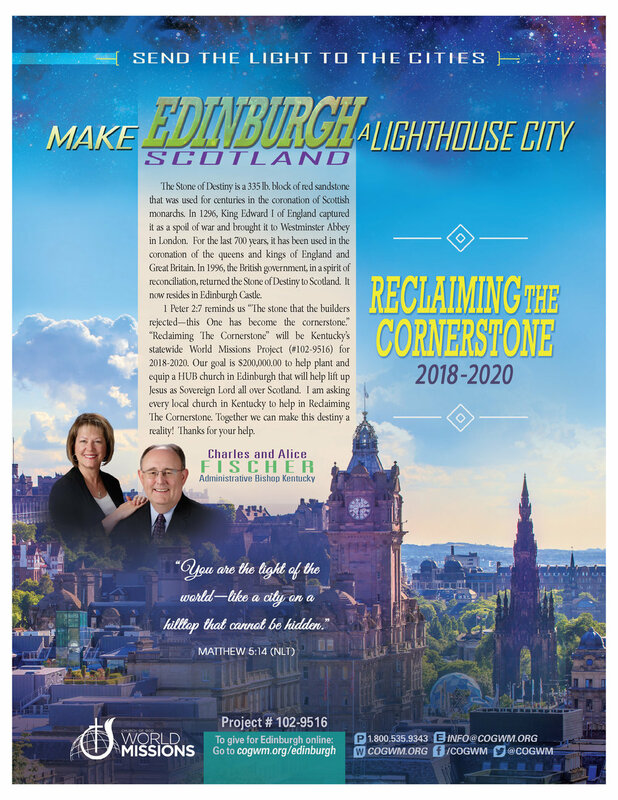 Make Edinburgh a Lighthouse City is our State Missions Project for 2019. Church of God World Missions has chosen the city of Edinburgh as part of the Send the Light to the Cities initiative. Almost 20% of the 500,000 residents of Edinburgh are in their 20s. More than half the population professes no religion. The city is growing at a rapid rate, forcing over 25% of citizens into poverty. The resulting increase in property prices prohibits buyers from purchasing new land, and puts a demand on the market making it hard for residents to find suitable housing. Income has not grown to match the escalating cost of living. Pray for evangelism, teaching, and church planting throughout as leaders embark upon the city. Pray for financial resources and missionaries who are called to Edinburgh, Scotland as they fulfill the Great Commission. Paula Farmer, Robert Baker, Johnny Dunbar, David Calvert, David Douglas, James Sulfridge, Ruford Abner. Any person contemplating planting a church in Kentucky should request a copy of the Church Planting Manual: Please contact our office at (859) 252-1793. The Church of God in Kentucky believes in church planters. In fact, Bishop Rabon has composed, and the State USA Missions have adopted a church planting manual that will assist ministers in Kentucky who are called and gifted to become certified church planters. 1. Be recommended by the State Bishop, USA Missions Board member, or pastor. 2. Be nominated by the USA Missions Board or State Bishop. 3. Be approved by the State Bishop. 4. The appointed USA Missions Board has numerous experienced church planters who will serve as mentors and coaches for the church planters. (1) Read through the Kentucky Church Planting manual so you have insight on the rewards and challenges of planting a church. (2) Take the church planting self-evaluation. (3) Develop a strategy using the nine-month startup questionnaire in the manual. (4) Submit a five-page report to the State Administrative Bishop & USA Missions Board stating where you are in your process. Include the following. (a) Have you chosen the city or community? (b) Have you chosen a location? (c) Have you developed a core group of 35 people or more to help you launch your church plant? (d) Have you received a religious non-profit 501 (c)3 (e) Have you received your EIN (f) Have you opened a bank account and started raising money by asking people to start investing in your vision? (g) Where are you in your nine-month startup strategy? (h) Do you have a church supporting you in this church plant? 1. The Kentucky State Missions & Church Planting Board includes numerous church planters that have a wealth of knowledge and experience who are more than willing to walk beside church planters to encourage and coach them through the tough times. Remember they and their spouse have been where you are going. They feel your pain. And, if there is one thing a church planter wants it is to see another church planter succeed and enlarge the kingdom of God. 2. Undergo the assessment through the Kentucky Church of God to help determine if you should plant a church and to gauge your strengths and weaknesses. 3. Consider participating in a Church of God for a period of time that is open to investing in your God-called planting vision. We will refer to it as a church planting residency. 4. For more information, contact a USA Missions Board Member, the State Office, or visit the State website kycog.net (Click the Department tab, then click on Church Growth).